Firework "Luminous Night on the Middle Rhine river" opposite side of Boppard with round river cruise. Rhine River boat s653luec-robs, length 35,75 m, width 7,20 m, with departure in Rudesheim, Bingen, Assmannshausen, Bacharach and Kaub on the Rhine River. round cruise boat ticket(s) for adults and children from 15 years offer no. BOF0908luec per person 37 EUR. There is a 19% added value tax included in the boat ticket price. Price change because of tax increase, diesel price increase, increase of the firework fee etc. possible until 4 months prior to the boat cruise date. If there is a price increase you have the right to cancel the boat tickets free of charge. Saturday, October 5, 2019, Boppard on the Rhine river. Boat trip to the firework "Luminous Night on the Middle Rhine river" with round river cruise. Firework on the Rhine river banks on the opposite side of Boppard, 2nd wine festival in the wine town Boppard. Departure in 65385 Rudesheim on the Rhine river (right Rhine river side), 5:30 p.m. Boat trip on the Rhine river along Bromserburg, Niederwald monument, Bingen with castle Klopp, Nahe river mouth and Mauseturm (mouse tower), ruin Ehrenfels, Assmannshausen, castle Rheinstein, Trechtingshausen with castle Reichenstein, castle Sooneck, Niederheimbach with castle Heimburg, Lorch with ruin Nollig, Lorchhausen, Rheindiebach with ruin Furstenberg, Bacharach with castle Stahleck, Kaub with castle Gutenfels and water castle Pfalz on the Rhine river, Oberwesel with castle Schonburg, Lorelei rock, St. Goar with castle Rheinfels, St. Goarshausen with castle Katz (cat), Wellmich with castle Maus (mouse), Hirzenach, Kestert, Bad Salzig, Kamp-Bornhofen with the enemy brothers, castles Sterrenberg and Liebenstein to Boppard with Kurtrierische Burg (Trier elector's castle) to the firework at about 8:45 p.m. The boat cruises during the firework in front of the old town of Boppard. The firework displays opposite of Boppard can be seen from the open air deck or upper deck. Seating place below deck, DJ music and dance from 6:00 p.m. Return in Rudesheim on the Rhine river about 1:05 a.m.
Departure in Bingen on the Rhine river (left Rhine river side), 5:45 p.m. Boat trip on the Rhine river along castle Klopp, Nahe river mouth and Mauseturm (mouse tower), ruin Ehrenfels, Assmannshausen, castle Rheinstein, Trechtingshausen with castle Reichenstein, castle Sooneck, Niederheimbach with castle Heimburg, Lorch with ruin Nollig, Lorchhausen, Rheindiebach with ruin Furstenberg, Bacharach with castle Stahleck, Kaub with castle Gutenfels and water castle Pfalz on the Rhine river, Oberwesel with castle Schonburg, Lorelei rock, St. Goar with castle Rheinfels, St. Goarshausen with castle Katz (cat), Wellmich with castle Maus (mouse), Hirzenach, Kestert, Bad Salzig, Kamp-Bornhofen with the enemy brothers, castles Sterrenberg and Liebenstein to Boppard with Kurtrierische Burg (Trier elector's castle) to the firework at about 8:45 p.m. The boat cruises during the firework in front of the old town of Boppard. The firework displays opposite of Boppard can be seen from the open air deck or upper deck. Seating place below deck, DJ music and dance from 6:00 p.m. Return in Bingen on the Rhine river about 12:55 a.m.
Departure in Assmannshausen on the Rhine river (right Rhine river side), 6:00 p.m. Boat trip on the Rhine river along castle Rheinstein, Trechtingshausen with castle Reichenstein, castle Sooneck, Niederheimbach with castle Heimburg, Lorch with ruin Nollig, Lorchhausen, Rheindiebach with ruin Furstenberg, Bacharach with castle Stahleck, Kaub with castle Gutenfels and water castle Pfalz on the Rhine river, Oberwesel with castle Schonburg, Lorelei rock, St. Goar with castle Rheinfels, St. Goarshausen with castle Katz (cat), Wellmich with castle Maus (mouse), Hirzenach, Kestert, Bad Salzig, Kamp-Bornhofen with the enemy brothers, castles Sterrenberg and Liebenstein to Boppard with Kurtrierische Burg (Trier elector's castle) to the firework at about 8:45 p.m. The boat cruises during the firework in front of the old town of Boppard. The firework displays opposite of Boppard can be seen from the open air deck or upper deck. 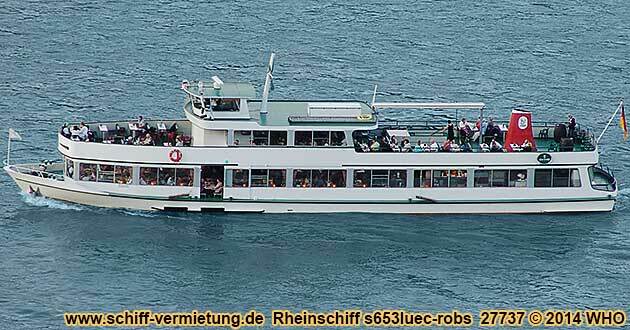 Seating place below deck, DJ music and dance from 6:00 p.m. Return in Assmannshausen on the Rhine river about 12:25 a.m.
boat tickets for children from 10 to 14 years with own seating place offer no. BOF0908luec per child 18 EUR. boat tickets for children until 9 years with own seating place offer no. BOF0908luec per child 18 EUR. Besides the elaborate drink offers, these warm / cold dishes are also offered on the boat in case of advanced order. In the boat ticket price is no food included. If you do not order food, it is not possible to have one of the following meals on board. Advance meal orders for groups wished. Meal and drinks will be payed separately on the boat. It is not allowed to bring own food and drinks on board.